InstantRadioPlay Toolbar is a browser plugin that will allow you to listen to the radio online. Even though it seems that it can help you to listen to the music, we still recommend being very cautious with this toolbar because you might cause harm to your computer instead. Specialists say that buttons embedded into the toolbar might redirect you to suspicious websites even if it seems that it will take you to the websites where you will be able to listen to the radio, discover music, and much more. As can be seen, it is rather risky to keep InstantRadioPlay Toolbar installed, which is why we suggest getting rid of it as soon as possible. It is not a problem if you do not know how to do that because we will provide you with all the necessary information in this article. InstantRadioPlay Toolbar does not differ from other Mindspark Interactive Network, Inc. toolbars, e.g. Webfetti Toolbar, AudioToAudio Toolbar, and RetroGamer Toolbar. If you have encountered any of these toolbars, you will definitely know that your homepage and search provider will be changed after the installation of InstantRadioPlay Toolbar as well. This usually happens because users do not uncheck checkboxes during the installation process. As can be seen, it is very important to be very careful in order not to notice the unwanted changes. If you have not been careful, it is not surprising that you see the presence of ask.com every time you launch your Internet Explorer, Google Chrome, and Mozilla Firefox. Even though ask.com is not harmful itself, you will still have to get rid of it if you decide to set another homepage and search provider. You will find out how to do that further in this article. You might think that it is enough to remove InstantRadioPlay Toolbar in order to clean the system; however, you should know that it is not enough to do that. Specialists working at pcthreat.com are 99% sure that there are other undesirable programs installed on the system. It is because InstantRadioPlay Toolbar usually travels bundled with suspicious software. In order to find out whether undesirable programs are installed on your computer, you should scan your PC with a trustworthy antimalware scanner. You can also try to detect all those programs yourself one by one. InstantRadioPlay Toolbar can be removed rather easily because it is enough to remove it via Control Panel if you use Internet Explorer or delete extensions from all the browsers if you use Mozilla Firefox or Google Chrome. Unfortunately, it seems that you will have to get rid of ask.com yourself as well because it will not disappear together with InstantRadioPlay Toolbar. 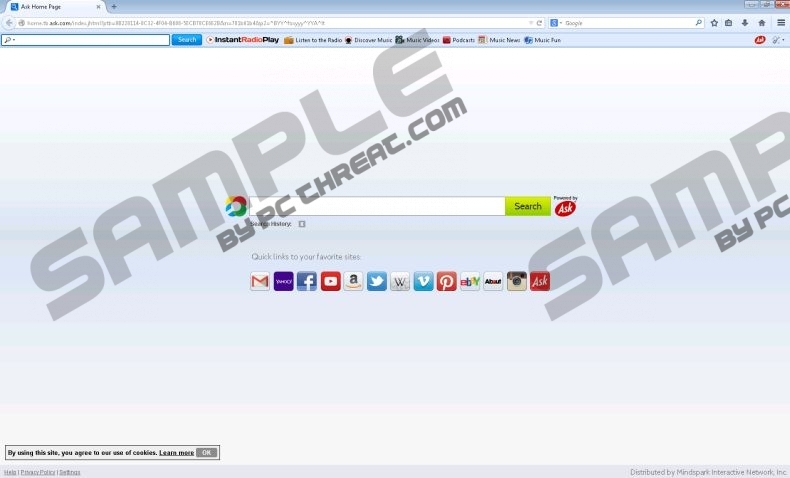 If you do not think that you are capable of removing this toolbar yourself, you should scan your computer with a trustworthy antimalware scanner, such as SpyHunter. Of course, we do not say that you cannot use another tool as well; however, you should make sure that it is 100% trustworthy prior to the installation. Tap the Windows key + R and type in control panel. Click OK. Select Internet Options and open the Advanced tab. Click Reset and then check the box next to Delete personal settings. Click Refresh Firefox when the dialog box shows up again. Find Show advanced settings at the bottom and select it. Click Reset settings and click the Reset button. Quick & tested solution for InstantRadioPlay Toolbar removal.